cries the 1st of May. Love your May Haiku and photo! Much appreciated, Belinda! 🙂 It’s so bone dry that the moss isn’t even growing. It’s curled up and sad. I hope you get the needed rain soon! We’re seeing colder than usual temperatures here but they say a warming trend is on the way. We have rain in the forecast but right now it is so dry that the ground is cracking; not exactly spring weather! Rain is in our forecast but it continues to be extremely dry; today we are supposed to get a high of 85! Small ground plants in the woods that tend to grow in groups; they like to socialize. When it gets very dry, they get shiny and droopy. Thanks, Jazz! 🙂 Stay perceptive and caring. I don’t believe I’ve ever seen a Mayapple. Mayhaw, yes. 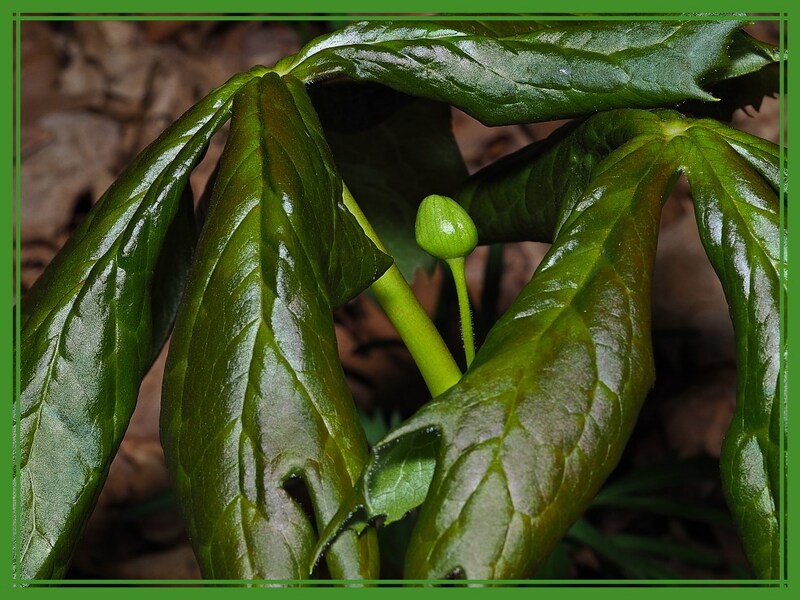 Is the Mayapple edible for humans, or is it only a treat for birds and animals? Well, even though i’m a vegetarian, you won’t find me snacking on any. They are mildly poisonous. The wild deer even avoid them. I’ll wish some rain for you and keep my fingers crossed – we are having rain Wednesday evening and Thursday and Friday as well. Too bad Michigan can’t share with Illinois. Interesting-looking bright-green Mayapple nestled in the dark leaves … I’ve never seen one before. We have it scheduled for Wednesday thru Friday too. We hope it happens. I used to live in Colon, Michigan, on Long Lake. I loved the vegetarian alternative foods there (that were mostly because of all of the 7th Day Adventists). We will get the rain a little before you do (we hope)!